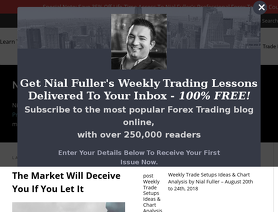 Learn To Trade The Market is the blog of Professional Forex Trader Nial Fuller. He is widely considered ‘The Authority’ on Price Action Trading. After starting his blog in 2008 he has become one of the most widely followed forex trading mentors in the world with a monthly readership of more than 250,000 traders across 50 + countries. Learn more about Nial Fuller here. I have been through and traded numerous other "systems" or courses, and had marginal success and much more failure in the markets before coming across Nial Fuller's course. After going through his course and a full year's worth of trading, my mindset, patience and trading has grown tremendously. I had an excellent year of profitable trading across Forex, but also applied the same methodologies to individual stocks and the overall market. If people are expecting a course where they will come away with 80% - 90% successful trades, they are looking at it in the wrong way. Not only that, they will be searching for a LONG time, because it doesn't exist. What you will get out of this is extremely honest, informative and positive trading mentorship that can guide you to becoming a more successful and profitable trader. Even the free articles are worth every read and the added bonus is that Nial includes work about other well-known successful traders that one can look into. The bottom line is that this course for me was absolutely worth the money and is something I would highly recommend if someone is willing to put in the work and become a trader. I have joined Nial's LTTTM course since January 2017 and been active member in his forum. His trading way is relaxing, simple, and very cautious that leads to a consistent profitable trading performance. His method is very strict and seems slow motion for rookie traders in term of specified time frame and confirmation signals for instance. However he opens mind to advance traders for intraday trading, non confirmation entry, and trading with news. He releases a lot of free articles and videos of trading techniques, management, and psychology that all interesting and high quality, IMO. So everyone can firstly verify his quality from such free resources. My final note and this is very important that course members have to be active and creative in learning and practical his course by comprehensive and complete set to get the advantages, otherwise you will get only a less result. No edge, don't waste your time and money. Nial is a great writer and marketer but the stuff he teaches has no edge long term. After 2 years of studying his material I am still not profitable, not because of emotions or other trade management issues but because there's no edge. Just backtest it long enough and you see it. Price action signals on strong support/resistance levels sounds so damn easy but that's not real PA.
Now I'm studying with a different mentor, I finally starting to understand what real PA looks like. Have had a largely positive experience from Learn to Trade the Market. I totally get they are running an internet business as well as a trading firm...am not so sure why so many people have a problem with it?! Professional service and best teaching! I have been a member of Nial's service (lifetime membership) since 2012. I have come back to his material (which is continually updated). All I can say is that the more experience I have trading the markets, the more I see Nial's teaching to be the most concise and professional approach to consistent profits in the market. His service is exceptional and that is consistent over the last 5 years! Hi, I am not a writer, so please forgive my inability express how i feel about this place, it made a believer out of me. Nial is the most honest teacher in the web, and in very short time made a winner out of this humble trader. Instead i have a 20/20 hindsight move that will make you a successful trader and that is ,check out the website for "LTTTM.Com and the guy who runs the business Nial Fuller and see what i am talking about. 6) You will learn to read Forex charts without any indicators , and you will be able to trade successfully with complete confidence and without the need for a life jacket or Parachute. Finally , there are online Forums to help you with the process to become successful. I have been a member now for six years and have never looked back ( only forwards ) . Nial is a personal mentor that is dedicated to ensure each member has the right training and support needed to succeed, he is totally professional and what you see is what you get, so go ahead and check it out , Nial has over 19,000 members and that to me speaks volumes about the guy. Also check out Youtube and Nials short story to his success. So to round up if you want to be good at something worthwhile , you will need as i say to be responsible for your own actions and treat it like a job and of course you will need to have complete discipline and the patience of a saint. But you are saying to yourselves is it worth my investment and time, YOU BET , and it can also be enjoyable and challenging, so stop looking at other material and get signed up for a potential financial freedom, YOU WILL NOT BE DISAPPOINTED . Nial Fuller is the mentor that every aspiring trader needs. He is very passionate and very supportive. The support is unparalleled. He always replies to my questions via email. The Daily Commentary section for the members is very insightful that it helps you confirm with your own analysis and helps you plan your trades (he regularly updates us with his daily commentary WITHOUT FAIL!). I have been a member of the LearnToTradeTheMarket for less than a year and I can already see the improvements in my trades. Before LTTTM, I blew up my account several times. But after taking Nial's course, Im now having significant improvements in my trade and becoming more profitable and most importantly, I am now more disciplined with my trading decisions! The Money Management & Risk/Reward Control and Trading with Confluence are my favourite chapters. No messy charts and indicators just plain vanilla price action signal. It's powerful! I highly recommend Nial Fuller's Price Action Trading Course!